Dr. Roopa Ghanta is a Gynaecologist and Obstetrician in Apollo Cradle, Kondapur, Hyderabad and has an experience of 17 years in these fields. 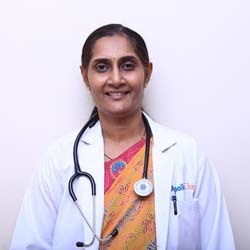 She completed MBBS from Dr. NTR University of Health Sciences Andhra Pradesh in 1997, DGO from Rajiv Gandhi University of Health Sciences, Bangalore, India in 1999 and CCPU from Australian Society Of Ultrasound Medicine in 2007. Simple radiology and Breast Cancer Screening etc. I delivered my baby under the supervision of Dr. Roopa. She is very talented and her patience towards the patients was really awesome. I just loved the timely housekeeping services. The best place I always recommend Apollo Cradle to my friends. Worthy to opt for! Dr. Roopa was amazing and efficient. She was very kind and friendly. All the nurses were very attentive and made me feel at home. Special thanks to housekeeping and food services. Why will anyone say no to the best pregnancy care! I am happy to have delivered my baby at Apollo Cradle. The superb doctors and nurses together offers the best care. My all-time favorite doctor is Roopa. She had extended her care even at odd night times when I was in need. The deluxe room was very neat and clean. My baby and I are happy because of Dr. Roopa. She is so talented and had those special set of skills to deliver the best care. Apollo Cradle is the safest place for your baby’s arrivals. I highly recommend it. I had delivered my baby at Apollo Cradle under the supervision of Dr. Roopa. She had all the skillset and talent to handle any risky case. She had safely delivered my baby and my pregnancy was so smooth and risk-free because of her ultimate care. I was admitted to Apollo Cradle, Kondapur. My gynae, Dr Roopa was so amazing and I felt so much confident having her around to help out. She will put you at ease and help you get rid of all your anxiety. The nurses are so empathetic and ready to help. A big thank you to the housekeeping staff who keep the healthcare clean 24/7. Mine was the suite and it was no less than a 5-star hotel. I will definitely recommend Apollo Cradle to my friends and family members. Initially, I was apprehensive about Apollo Cradle. However, I knew I had made the perfect choice when I got admitted to Apollo Cradle in Kondapur. My gynaecologist Dr Roopa is so good and so knowledgeable that all your anxiety goes away because you know you are in safe hands. My suite was luxurious, clean and definitely value for money. Thank you so much for the positive energy and giving me an amazing experience. I will even recommend it to my family and friends. A friend of mine suggested that I have my delivery in Apollo Cradle and it was definitely a good suggestion. Here, I was under the care of Dr Roopa Ghanta and let me tell you, she is an awesome doctor. She explained everything to me thoroughly and cleared all my doubts patiently. I opted for the deluxe room and it had all the basic amenities like TV and AC. Dr Roopa supervised my procedure at the Apollo Cradle. I am so grateful to her for taking such good care of me. The care manager worked so hard to make my stay comfortable. Thanks to the Apollo Cradle team for such a wonderful experience. I had an amazing experience at the Apollo Cradle under the care of Dr Roopa. The care manager at the hospital is very sweet and made me feel like home. The staff is cheerful and welcoming, making this a great time. The food here is excellent. Team, thank you for making my procedure a comfortable one. My experience at Apollo Cradle, Kondapur was great. Dr Roopa Ghanta, who attended us is very skilled and took complete care of me during recovery. The nursing staff was equally good and supportive. The hospital has a great infrastructure and is laden with facilities for the convenience of its patients. I’d pick Apollo for my all future treatments and would surely recommend it to my friends and family. From admission to discharge, everything was smooth. I love the sanitation here. The staff is very kind. Dr Roopa Ghanta is highly skilled and experienced. The rooms and washroom are well-equipped with basic amenities. I am sure to pick Apollo for my future treatments as well and would recommend it to my friends and family as well. Thanks, Apollo Cradle! I found Apollo Cradle, Kondapur to be well maintained, hygienic and also has a great staff, especially Dr Roopa Ghanta. I am really satisfied with the kind of treatment I received here. The staff is courteous and the services provided are all excellent. Everybody around is considerate and does their best to make you feel at home. I’d surely recommend it to my relatives and friends.